The review embargo for the ThorRagnarok movie is over and the first reviews are flooding the Internet. They're amazingly positive. It currently stands at 100% with 30 reviews certifying it "fresh". 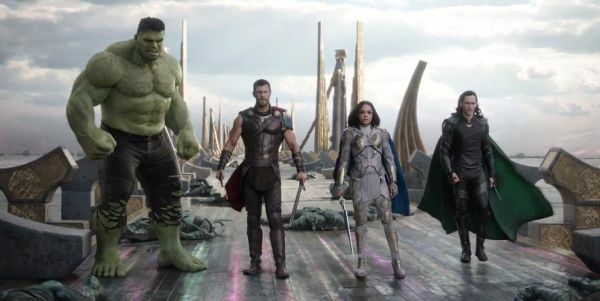 The critical consensus is "exciting, funny, and above all fun, Thor: Ragnarok is a colorful cosmic adventure that sets a new standard for its franchise -- and the rest of the Marvel Cinematic Universe." While it's an amazing score it'll likely drop in the next few days or weeks. How much? Let's look at the numbers. Of the 16 MCU (Marvel Cinematic Universe) movies, five have kept a rating over 90%: Iron Man (2008), Marvel's The Avengers (2012), Spider-Man: Homecoming (2017), Captain America: Civil War (2016), and Guardians of the Galaxy (2014). The total average for the MCU is 83%. The highest so far is Iron Man (2008) with a 94% rating and the lowest is Thor: The Dark World (2013) with 66%. In fact, all the movies have been certified "Fresh" with the exception of The Incredible Hulk (2008) and Thor: The Dark World (2013). It's a pretty impressive franchise. Expect the movie to stay in the 85-95% range by the end. Everything we've seen just makes us more excited to see the movie! It's coming in less than a month! Are you looking forward to Thor: Ragnarok? That won't last because there is always a hater, but it's a great sign. A blogger friend has already seen an early preview and said it was amazing. You're right that not everyone is going to love the movie. In fact, it's guaranteed there will be some who hate on it for attention. But all signs point to a fun and enjoyable movie. I'm sure the reviewers are grading on a popcorn movie curve. I mean 100% would put it up there with Citizen Kane or The Godfather.